This spring, I've been spotlighting the picture book recommendations of librarians. I'm loving the high quality of these selections! Matthew C. Winner (library media specialist-turned-author) directed me to The Sound of Silence (Katrina Goldsaito, illustrated by Julia Kuo). He also kindly included a mention of my book review in his amazing All the Wonders podcast series. (Thanks again, Matthew!) Click here to listen. I also received an excellent recommendation from Rita Meade (public librarian and author), who shared several picture book suggestions, including an old favorite of hers - Heckedy Peg (Audrey Wood, illustrated by Don Wood) - which completely delighted my kids. So fun collaborating with Matthew and Rita! It's my pleasure to now introduce a local recommender: Ginny Sieck, library assistant at the Geneva Public Library. If you've ever attended toddler story time at Geneva Public Library, you know Ginny. She has led story time there for 17 YEARS! All three of my girls have participated in her fun literary adventures. Ginny is a PRO at introducing young ones to the concept of sitting still (so hard!) and paying attention to narratives. Here's my Little Ms. L at her first GPLD story time... See? Hands clasped even! Exactly HOW does Ginny keep these tiny ones with her? I'm not entirely sure, but it includes a combo of lively readings, puppets and catchy songs. It's truly a wonder to behold. Ginny and I recently chatted about some of her favorite picture book titles. A big fan of Candace Fleming, Ginny enthusiastically recommended Muncha! Muncha! Muncha! - one of her all-time faves (illustrated by G. Brian Karas). Muncha! Muncha! Muncha! is about a man (Mr. McGreely) with a dream. Perhaps you share it: Having a beautiful garden. ... until three little rabbits decide that Mr. McGreely's garden is their private buffet. The first time the bunnies sneak in and munch on some sprouts, Mr. McGreely is miffed, but assured he has it under control. But with every defense he mounts, those sneaky little bunnies figure out a way past so that they can "muncha, muncha, muncha" all of his green goodies. Repetition: Each time the bunnies bust through Mr. McGreely's elaborate fencing, they feast in the same way ("muncha, muncha, muncha"). The instant that my girls hear me say the first "muncha," they know just how to finish the phrase. Their confidence in participating makes reading the book a total joy for them. The Bunny Hunt: As Mr. McGreely erects his fencing structures, you can see the bunnies in the distance (in Karas' illustrations), planning a counter attack. My "bunnies" love finding the conniving hoppers on each spread. Furry Fury: As the story presses on, Mr. McGreely's anger goes from a simmer to a rapid boil - a progression that my girls unfortunately recognized with ease. ("Mom, sometimes YOU get furious." True, little bunnies. True.) They love watching the escalation of the gardener's temper. Muncha! Muncha! Muncha! is LOADS of fun. When I read it to the kids, I've taken to naming the three little bunnies after my girls. They think that is pretty silly. Although... maybe not quite as silly as wearing a headband on top of a sun hat (below). This season, we've expanded our own family's garden to include bell peppers, tomatoes, eggplant and kale. Here's to hoping that our hoppy friends stay out... That's MY dream anyway! In "Ask A Librarian," I spotlight picture books that are flying under the radar or haven't gotten the love and attention they deserve. Who better to ask for a solid kidlit recommendation than a librarian? In case you missed the first one, here's the link to a great reco from Matthew C. Winner. The next selection comes from public librarian Rita Meade (@ScrewyDecimal). Big congrats to Rita for being named an Anna Dewdney Read Together Award finalist for her picture book Edward Gets Messy! Rita's picture book recommendation for me? Heckedy Peg by Audrey Wood, illustrated by Don Wood. 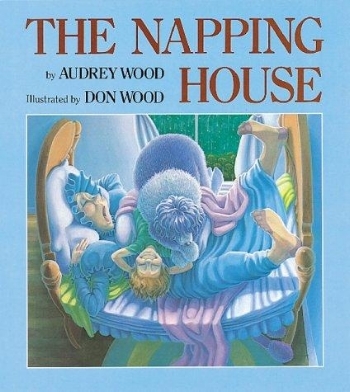 Audrey and Don Wood are the wife-and-husband duo best known for the The Napping House. The Napping House and Heckedy Peg both feature a domestic setting, repetition and luminous art, but the similarities end there. Heckedy Peg (first published in 1987) is one creepy book... and my children completely LOVED it. I'm not sure what caught me more off guard - the darkness of the story or my kids' affection for it. Me: What's your favorite part of Heckedy Peg? My 4-year-old daughter: When the witch takes the kids. But then I remembered how drawn I was, as a child, to the stories of Danish author Hans Christian Andersen. The threat of evil is always lurking just around the corner in all fairy tales. From the start, you can feel that Audrey Wood is setting up a riddle-of-sorts. The story's seven children aren't named Molly or Sam or anything remotely predictable. Their names are Monday, Tuesday, Wednesday, Thursday, Friday, Saturday and Sunday. Within minutes, they do both - tricked into disobeying their mother by a wicked one-legged witch named Heckedy Peg. After quickly talking her way into the thatch-roofed home, Heckedy Peg turns all of the children into food. FOOD. That she intends to eat later. The witch then hightails it across town with the food (kids) in her rickety cart and settles in for supper in her spooky forest hut. The mother tracks them down, but to earn her kids back, she has to play a high-stakes matching game: Which kid has become which food? Heckedy Peg is a wild ride that's more engaging and other-worldly than it is scary, and it introduces darkness in a safe, familiar way - through straightforward good and evil forces. I suspect that Heckedy Peg's characters and images are now imprinted in my daughters' foundational book bank. Thank you, Rita, for this high-quality suggestion, and thank you Audrey and Don Wood for creating this classic title. Who doesn't love a good recommendation? Is there a picture book gem that has escaped my attention? When I walk into my local library with my girls, we head straight to the "New Picture Book" bins. There are always lots of goodies in there. What fabulous picture book (currently under the radar) deserves some attention? I recently posed this question to elementary library media specialist Matthew C. Winner (@MatthewWinner) - co-founder of the incredible book exploration platform All The Wonders and host of the ATW Podcast. Here's Matthew! His recommendation? The Sound of Silence by Katrina Goldsaito, illustrated by Julia Kuo. Swoony-swoon cover art: The Sound of Silence earned a standing ovation from me right away, from the cover alone. So much is accomplished in this design (above). We are introduced to the charming protagonist, Yoshio, who is at the center of the quest at hand. The absence of color in the cityscape hints at the silence we are about to learn more about, and the use of white space around Yoshio delivers "silence" in yet another profound way. I also happen to be VERY partial to pops of yellow - Wes Anderson knows what I'm talking about - so I was completely won over by Yoshio's accessories, as well. The soundtrack of Tokyo: On the first page of the book, Yoshio opens his door and instantly meets Tokyo. He steps outside and is inundated with sounds - honking horns, squealing brakes, puttering motors. It's a "symphony" to Yoshio, and he takes it all in eagerly. Yoshio parses everything he hears, honoring the role that each sound contributes to the composition. A new sound - the squeaky, vibrating sound of an instrument - draws him into a chance encounter with a musician. The koto player shares that "ma" (the sound of silence) is her favorite sound. With great curiosity, Yoshio then embarks on a journey to find "ma" in his noisy city and busy family life. Universal sounds in an exciting new world: Yoshio's quest acquaints us with Tokyo and its rich, complex sounds. We travel through a bamboo grove at the edge of the playground (takeh-takeh-takeh). We watch as bullet trains pull into and out of the station (whoosh). In Yoshio's home, we hover above the family's dinner table (slurping and chewing and swallowing) and Yoshio's tub (Drip. Drip. Drip.). As the story moves along, Yoshio expands our understanding of Japanese culture while also subtly and beautifully pointing to daily routines that connect us all. Lovely typography and artwork: The display type featured throughout The Sound of Silence was hand lettered. This results in a gentle and precise reinforcement of the narrative's sophisticated storytelling. It reads classic and timeless, yet also plays freshly across the book's lush backdrop of steely teals, vibrant greens, steady taupes and warm peaches. I found myself lingering on every word, which allowed me to really absorb Goldsaito's writing. The school house image below is a good example of the artistic brilliance presented page-after-page. The palette is so rich, and the world so thoroughly conceived. And the shadows and highlights and framing elements pull you in and focus your exploration. Julia Kuo's work is pristine. Sound between sounds: The central idea of the book is that "ma" isn't just silence, but the silence BETWEEN sounds. In English, there is no direct equivalent for "ma." But isn't "ma" a fascinating concept? To understand, appreciate and label the sound between sounds, you have to make yourself STILL. You have to SLOW DOWN. You have to LISTEN and make yourself SMALL. Thank you, Katrina Goldsaito, for inviting your readers to seek "ma." Perhaps if we tuned into it "ma," we could better understand our surroundings and where we fit into our world. My little ones may have been a bit young for this story. But I loved introducing them to this new and very real world. The Sound of Silence is a portrait of lyrical and illustrated excellence. My recommendation? Check it out! THANK YOU Matthew for the fantastic selection! I'm so glad this book didn't pass me by. And congratulations Katrina and Julia for The Sound of Silence's inclusion in Brain Pickings' Best Children's Books of 2016. SO DESERVED!